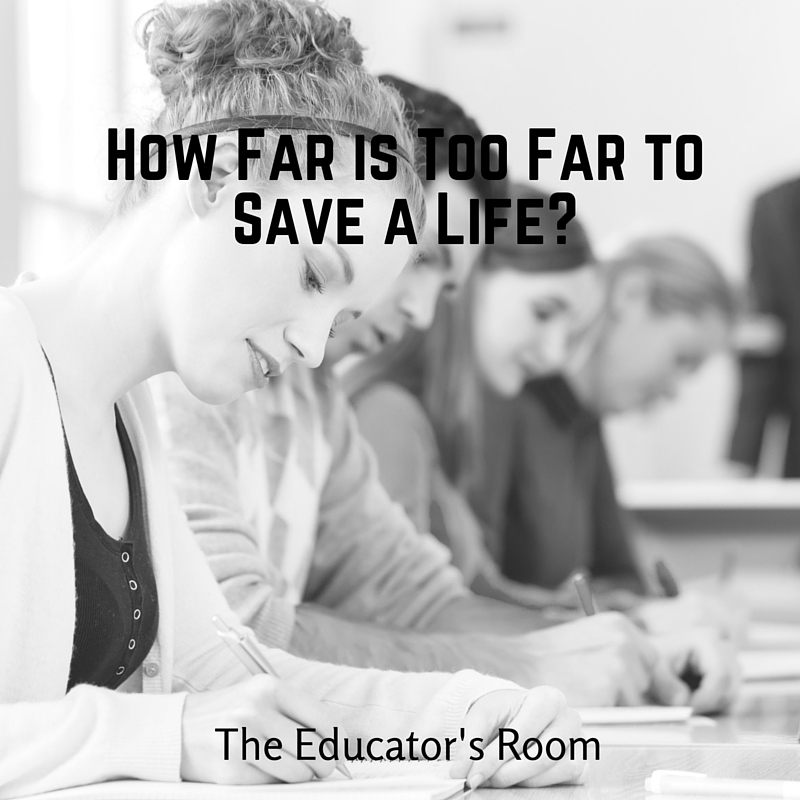 How Far is Too Far to Save a Life? The phone rings at midnight. That’s never a good sign, right? We imagine our relatives in a terrible accident, something gone wrong for our parents, or our children in trouble. But when you are a school administrator, you have to figure there is a chance the school caught fire, got burgled, or generally something went kaput. My midnight caller was indeed a parent of a student in my school. You see, my school was a little out of the ordinary. It is a private school for children on the Autism Spectrum, with students at all functional ends of that spectrum. Some of my students already lived in group homes, some were at home with parents, and some were transitioning to college. Like I said, we served all kinds of students with all kinds of functional levels. This caller was the father of one of my high school girls in our advanced class. She had Asperger’s Syndrome, and she was making amazing progress socially. In fact, she was dating one of our high school boys. The father called me at midnight because Laura had received some texts from her boyfriend, Kevin, and his mood was very depressed. As the texts progressed, he told Laura that he had a gun and was going to kill himself. Laura, afraid for her boyfriend’s life, gave the phone to her father. The father called me first, not knowing what to do. My first call was to his parents, to enlist their help. Despite calling them three times, they didn’t answer, and I was really worried for his safety. So my next call was to 911 for a wellness check. Fortunately, I had access to the school’s Student Information System from my smartphone so I could give his address, date of birth, etc to the 911 operator. I waited impatiently, worried that they would find him already dead, gun in hand. The helpless feeling is indescribable as you wait in your own quiet bedroom, your own children sleeping peacefully down the hall, wondering if the police will make it in time to save the life of a child. Then I began to doubt myself and wonder-Did I go too far calling the police? About 1:30 in the morning, I got a phone call from the police. Kevin was indeed in his bedroom with a gun. He was Baker Acted and taken to the hospital for a 72 hour hold. The next call was from his parents, who were angry– with me! At 2am, I was called every name under the sun (and learned some new ones!) because I called the police on their child! Why had I not just called them, left a message, kept my nose in my own business? It was a long and sleepless night after that. Of course, the following morning, they were planted in the the chairs outside my office when I arrived. Their volume and vocabulary alone was enough to keep others away from my office for a while. How in the world could this be turned back on me? But I had to sit in quiet meditation and find some perspective. The reason this child found himself in a place of suicidal contemplation was because the parents were dysfunctional. Laura’s parents were equally berated for getting involved, although I was able to offer them a sympathetic and encouraging shoulder. They did what they thought was best for Kevin by reaching out to the only person they thought could help, which was me as the school director. There was no easy answer, and the solutions were complicated and messy. Kevin returned to school, but all the students knew what had happened because his parents had broadcast it so loudly. His behavior clearly reflected that he blamed me for his “arrest,” which is how he referred to it. We all know that a Baker Act involves a hospital admission, but in his mind, going out in handcuffs in the back of a police car, he viewed it as being arrested. He began to vocalize his desire to kill me. Now you and I are both thinking that when a teacher hears a child vocalize homicidal ideations, we report it, right? This is the part where I tell you how much I regret hiring this particular teacher because she, in fact, did NOT report his statements; that is until they escalated to a very specific bomb threat that described my mutilated body. Yes, she seriously waited to report these conversations until she heard him describe how my blown-up body would lie mangled in the parking lot. Sigh. Oh, and then he mentioned that he might have that bomb in his backpack right now. With the campus evacuated, police dogs swarmed the campus sniffing the backpacks for explosives. My midnight phone call had led to the making of an apparatus that looked somewhat bomb-like for Kevin to show off to his friends in an effort to punish me for having him arrested. Did I go too far? Should I have minded my own business and not interfered when he wanted to kill himself? To this day, I will solidly defend my actions. I know people who have committed suicide and can only imagine the dark, lonely place one must find themselves in to see death as the only relief. I have guilt not knowing they were so close to that brink; I question myself as to whether I could have made a difference. As an administrator of a school for children with special needs, I feel a very strong obligation to provide for their health and safety, and I am deeply attached to each child, their family, and their future success. Do I feel I went too far? No sir, no ma’am. I would do the same thing again. Sadly, I had to expel Kevin because his choices made the school less safe for everyone. Those parents were again very vocal and verbose about their negative feelings towards me for expelling him. At the end of the day, though, my other 149 students, 35 teachers, staff, and I deserved protection. By getting help for Kevin, I believe I protected him, too. So did I go too far? I sleep well at night knowing I did all that I could. Good for you Amy! I would have done the same thing. I have to wonder what his parents would have said if he in fact had killed himself and they found out that you knew about it. What a lot of people don’t know is that in many states teachers are mandated reporters of anything that might cause harm to a child. I am glad that you followed your conscience and save his life. Thanks! We are mandatory reporters here in my state, but beyond that, my own conscience would never have allowed me to NOT react. They would have sued me in a heartbeat if I had known and hadn’t responded. Darned if ya do, darned if ya don’t, sometimes. Thanks for your comment! !